​Food processors and choppers provide versatile tools for chefs of any skill level and interest. Mini choppers offer an excellent way to handle quick tasks like chopping nuts, while larger food processors can perform more diverse functions, like chopping and pureeing. With so many potential uses, you should want a food processor in your kitchen. However, not all processors are equal, and some are far more suited to specific chefs and cooking habits than others. To help you find the one that suits your needs, we present our guide to the best food processors. Food processors come in all sorts of different sizes with different functions, meaning you can choose from many different models on the market. You’ll want to find a processor that has the right range of features and size suited for your kitchen. Food processors come in a wide array of sizes. Some can only fit a few cups, while larger processors can hold anywhere up to five or seven cups. If you just need a processor for chopping smaller portions, then a mini-sized unit will do more than enough of the job for you. When you’re working with high amounts of product at a time, you’ll want to look for a larger-capacity product. Larger food processors work best for those who want to work with dough, but those who want to do a lot of work will have better luck with purchasing a mixer. 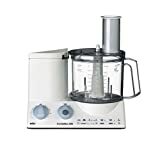 Likewise, the liquid capacity of a food processor tends to be about half of the volume of solids, and filling a processor higher than that is likely to end in leaks. Those searching for a product to handle a lot of liquids and smoothies should pick out a blender instead. Beyond just chopping, food processors can perform many different functions. Mini-choppers are likely only to have one blade, but larger capacity units will have several included. There are blades and discs suited for chopping, grating, mixing, pureeing, and shredding. You should pick out a machine based on what uses you want it to do. Make sure if you’re selecting a more expensive unit, it has enough discs to be worth the price. More and more food processors combine with blenders and have additional attachments to handle processing. These can’t handle the same heavy-duty jobs as dedicated processors, but they provide the benefits of several appliances for better price value. A feed tube on a food processor will let you add more product to the processor as its running and allow you to make sure all food comes chopped up correctly, so they’re a great accessory to have with your unit. Beyond just getting a feed tube, you also want to pay attention to its size. A broader tube will allow you to fit larger sized objects, meaning you’ll have to do less pre-chopping before starting up your machine. The actual procedure of food processing involves a lot of high-speed rotation, which means its critical that your unit has a solid construction to hold up to the motion. Bowls and blades should all fit securely in their housing so that they don’t detach during operation and cause mess or injury. More massive bases also help to keep the whole unit more stable. Looking over your processor before a purchase can help see how well the pieces fit together. Checking reviews will also give you a good idea of how long the model will last you—again, make sure the price you pay is worth the quality of product you’re buying. Any form of food processors will make some noise while in operation, but many have sound control to make it more bearable. Full-sized processors tend to have better sound ratings, but you should also make sure your unit is tolerable to use. A mini-chopper will be louder, but that doesn’t mean it has to be deafening. Consider what level of sound you’re willing to put up with as you work. Most processors require all parts in the proper positions before the machine will even start. This construction is good because it keeps you from having any mishaps. Easy assembly tends to mean the parts will audibly click together so that you can tell they’re secure. Feed tubes also come with pushers to help load food into the processor. Be aware that a processor may not start until you have the pusher in the machine. This build is almost a double-edged sword: it protects you from accidentally damaging your fingers or another appliance by trying to push food in with anything besides the pusher, but it means you may have a hard time adding in extra items while still running the processor. Since food processors are complicated devices, a guarantee will do good to be sure you don’t have to replace your investment. The terms of a warranty may mean the company will send you free replacement parts, while others require you to mail back the machine at your own expense for service. You can expect the length of the warranty to last between one to three years. Beyond just parts services, an additional warranty on the motor can potentially last up to ten years. Will the food processor cover the functions you need it to, or will you bet better off with a specialized appliance like a blender or a mixer? Will you be able to run the parts through a dishwasher, or will you need to prepare yourself to wash the blades by hand? Will you need to use the processor for large cooking jobs, or just the occasional chop? Do you have space to store the processor and all the additional accessories? Sorting through all the options to get a processor that suits the needs of your kitchen will go a long way to helping you pick out the best possible model. Now that you know what to look for, here are our candidates for the best food processor available. At first glance, the Cuisinart 14-cup food processor seems like a simplistic model, but you shouldn’t underestimate its capacity to get the job done. There are just two different pulse options and one bowl, making for a processor that’s beyond comfortable to use and can clean in the dishwasher. That setup doesn’t mean you’re limited in what you can work with, as the Cuisinart comes with several blades and discs to handle the entire scope of everyday kitchen tasks, as well as an extra full feed tube. It also performs consistently, processing vegetables, herbs, and even blending functions for foods like homemade mayonnaise. While this processor comes with a warranty, some users report that getting any repairs through customer service is a hassle. 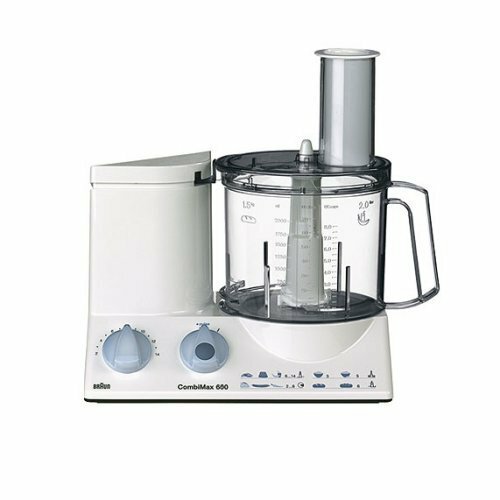 Beville’s BFP800XL Sous Chef Food Processor takes on kitchen tasks, no matter the size with its 16-cup capacity. It comes with both a large and small bowl, plus three blades and five discs, meaning you have enough versatility to tackle any heavy-duty jobs that need to be completed. It even scores high in professional performance tests. Despite its high potential for use, the BFP800XL is by no means complicated to operate. The clearly labeled buttons are easy to see what functions they have, and the flat service makes the whole machine easy to clean when you’re done for the day. The multi-function and heavy-duty capacity make this processor a top pick for any serious chef, but the price creates a major downfall. At $$$, it takes a dedication to the kitchen to pick this machine up for your home. Falling into the same price range as the Cuisinart is the Braun K650 Multiquick food processor. While it has a smaller cup-capacity at 9, this machine comes with a vast array of accessories that give you even more options in the kitchen. With this model, you’ll be able to handle any task between grinding down hard foods all the way to slowly shredding cheeses. One of the best features of this food processor is in the speed settings. While many other processors only allow you “on,” “off,” and “pulse” options, the K650 lets you manually control the speed from anywhere between 300 and 2000 rpm, allowing you to customize your settings to best fit the food you’re preparing. While the speed and accessories combine to give you an almost unbeatable amount of versatility with this model, there isn’t a case to store all those extras in, making finding enough room to put everything a hassle. Even though all the parts are dishwasher friendly, this processor takes a little more effort to clean up, too, as soft foods tend to stick under the rim. 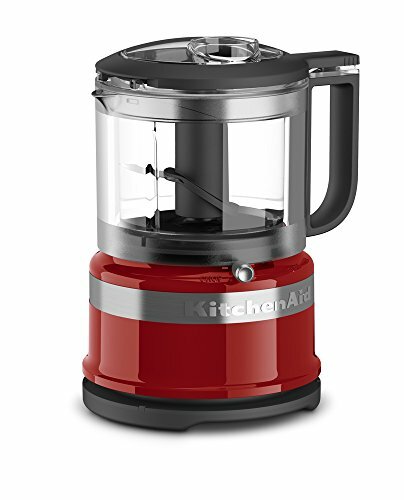 For those that aren’t interested in doing any substantial work and need something small, KitchenAid’s 3.5 cup mini food processor does the job. It can handle any smaller tasks like single chopping vegetables or even preparing small batches of vinaigrette, meaning you don’t have to manage those tedious tasks by hand. The handled jar makes this option easy to handle and the button operation means it’s intuitive to use. This processor provides one of the most effective budget options available, so you don’t have to spend excessive amounts of cash to get a quality product that won’t take up too much space. Of course, the smaller size means you’re limited in what you can process—no kneading dough or chopping large quantities of food with this on your countertop. 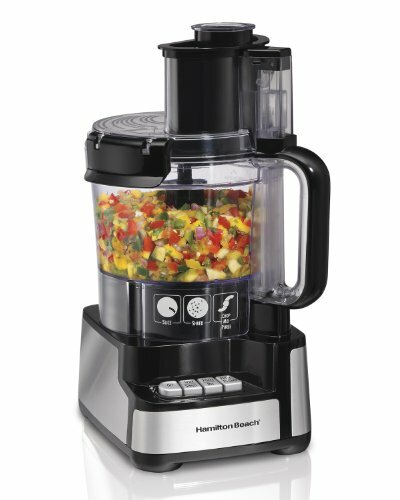 For another inexpensive food processor with a little more capacity, there’s the Hamilton Beach Stack and Snap 70725. This machine only costs $, but it has a 12-cup level of space that can even handle tasks like mixing pizza dough. It has two different speed operations, plus a pulse option, giving you even more versatility than some higher quality models. The “stack and snap” in the name refers to the assembly process—put all the pieces in order, snap them into place, and you’re ready to start processing. For a budget machine, it handles most tasks surprisingly well, making it an excellent choice for anyone who wants to get a product that does the occasional food prep without having to invest any substantial cash in the purchase. One thing you’ll have to keep an eye out on is that some foods don’t make it down into the blades even if they fit in the shaft, so you may end up doing some extra chopping by hand before you can let the processor handle the rest. This processor is another one you’ll have to take some extra care with cleaning, too. Different chefs require different tools for their kitchens—but even so, there can only be one best food processor. Our top pick goes for the Braun K650 Multiquick. Even though it only has a nine-cup capacity, that’s more than enough to handle most kitchen tasks. The adjustable speed is what sells this processor, plus the high number of accessories makes for an even better value for the money. You may need to figure out your storage space, but having those extra options will come in handy. While the exact unit you pick will vary on your cooking needs, there’s no doubt that a food processor is a worthwhile investment.